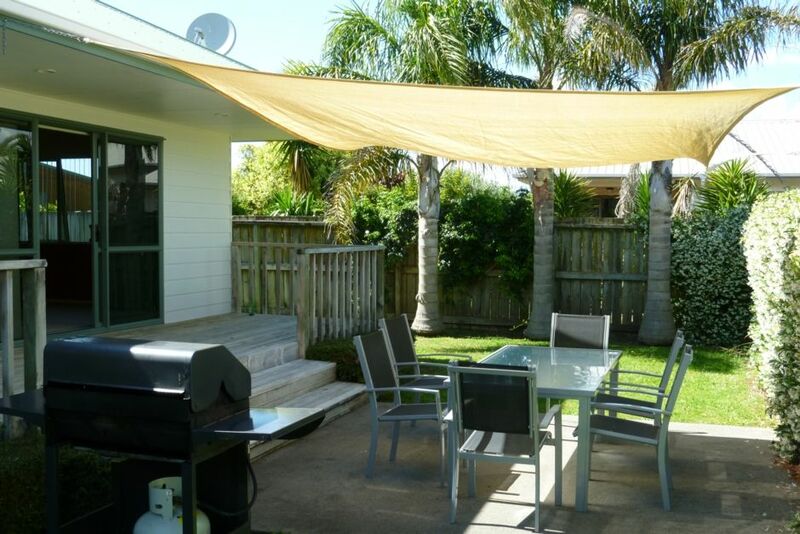 Modern three bedroom house, situated in quiet cul-de-sac with large deck and entertaining area with shade sail and outdoor lighting. Fully equipped kitchen with all modern conveniences, Separate shower and bath in bathroom. Laundry facilities in garage. Large 55' Flat screen TV with freeview, and dvd player. 500 meters to beach. Large hooded gas barbeque. Plenty of parking for boats and cars. Walking distance to town, restaurants and cafes. Whitianga offers spectacular beaches with the following activities available: Boating, Biking, Diving, Fishing, Kayaking, Swimming, Golf, Tennis, Bowls, Horse Riding, Seven minute walk to The Lost Spring hot pools and much more. My husband and I Honeymooned in Whitianga. We loved the area and all it has to offer. When we got the chance to buy our Holiday home we didn't hesitate. Still love the area as it has changed for the better, has more things to see and do. Quiet cul-de-sac. 2 minute walk to very safe beach. Very well kept but dated decor. If you come to Whitianga you come to holiday not be lazing on the internet cooped up in a Bach. So it goes that there is no internet connection at this property and I for one was glad. The owners have kept a very tidy rental property providing the resources to also allow you to enjoy the outdoors also ... a kayak, bodyboards and bikes are all provided but it was with regret that we couldn't use the bikes and that was more than likely due to previous tenants mistreatment, a bit of a let down but I can understand if they don't fix them. Absolutely happy as with what we got and will return (if they let us). Great house, had everything you needed for the stay. Nice and clean close to everything... Loved it thank you. Thank you so much for your fantastic review, we really appreciate it. Cleaner txt me after your stay and this is what she had to say..
"Best people ever, get them back anytime". So I am happy to welcome you back anytime in the future. Very pleased to here you enjoyed your stay. Highly recommend as future clients. A great property that had everything that we needed. Central to everything. Clean and tidy. Instructions on how to set the oven would be handy. We loved our stay and would highly recommend. Thanks. Thank you for your great review, we really appreciate this. Sorry to hear the oven had been turned off before your stay. Thank you for letting me know I will get that sorted. Pleased to hear the house was well equipped for your stay and you enjoyed your holiday. Great guests. Welcome back any time. Loved it so much. Wish we could've stayed longer! !